Home >> Freeware >> Portable Apps >> Make Windows Always On Top,Translucent, Minimize, Hide Window, Enable Window, and Disable Window In a Single Click Using WinSpike. There are times when you wanted opened windows in Windows OS perform some functions like Always On Top, Disable Window or Hide the windows.You can now do these simple functions on all opened windows using WinSpike which is a free tool that starts along with the OS and a with click on it’s icon in the system tray, a menu is displayed. 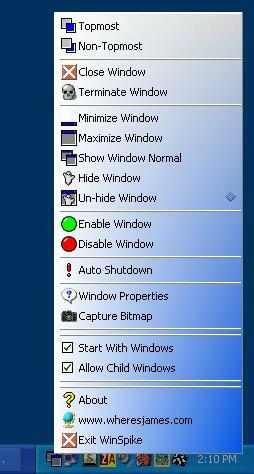 You can drag a menu an option from the menu on-top of any window to perform the specified operation on that window. You can take a screenshot of any window as a bitmap using the Capture Bitmap Image.